There are millions of metal halide and high pressure sodium wall packs around the World and ready to be switched to LED! It is imperative to have reliable outdoor security lighting that is bright, efficient and long lasting. You have 2 basic options when looking at updating your wall packs to LED. Our clients either remove the entire fixture and replace with a new LED wall pack or remove the HID lamp and install a retrofit corn cob LED bulb in the fixture. Typically the best way to go is to replace the old worn out wall pack. Overtime these wall packs have leaky seals and may not dissipate the heat build up which kills LED. LED Wall Packs are the new norm in new construction applications. The lifespan LED wall packs is 50,000 to 100,000 hours. We offer traditional LED wall packs from names like Eiko, Halco, Lithonia Lighting and PQL. All the brands we offer carry 5 year warranties and at least 5Kv to 10Kv surge protection. LED wall packs are 60-80% more efficient than their metal halide counterparts. 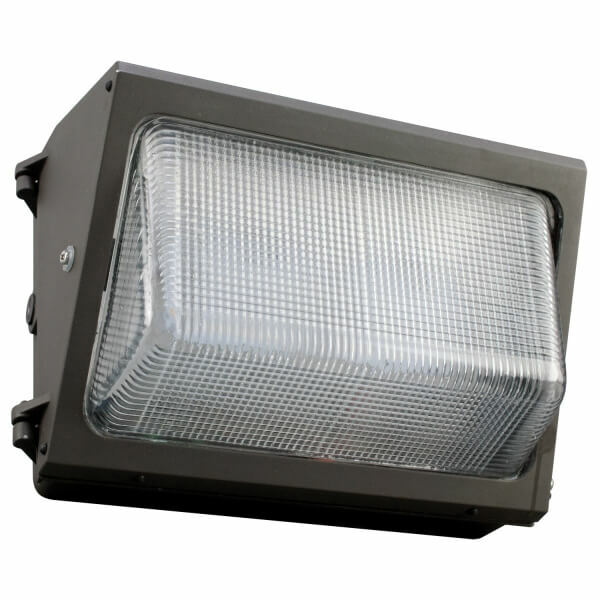 For example, a 40W LED wall pack fixture is equivalent in lumen output to a 150-175W metal halide!